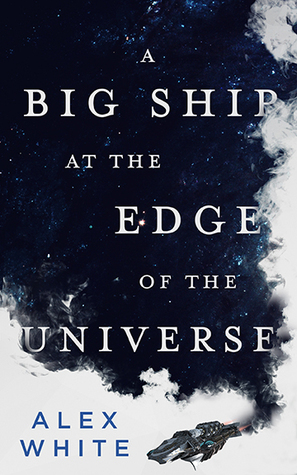 First off, I want to thank the publisher and the author for an ARC of A Big Ship at the Edge of the Universe. Receiving this ARC, in no way, shape, or form, determined my overall opinions or review. When I received this book in the mail a few weeks ago, I was already interested based off of the stunning design on the cover. It is absolutely breathtaking. The second thing I noticed were the blurbs. Nicholas Eames, author of my #1 Read of 2017 (see full list), Kings of the Wyld, has TWO blurbs. Yes, you read that right. DOS. Not only that, but in his review, he absolutely LOVED the novel. Not to say I have anything in common with Nicholas (except maybe our love of the written word), but that automatically moved this book up Mt. TBR. Boots Elsworth (hell of a name) is a washed up treasure hunter selling fake salvage adventures to enjoy a lasting meager existence. When she stumbles upon the story a famous warship known as the Harrow, a ship known for its devastating past, Boots may be in for more than she bargained for. Nilah Brio is one of the top drivers in the PGRF (Pan Galactic Racing Federation) and has quite the following, at least until she witnesses the murder of a fellow driver in the middle of a race. Now the key suspect and forced to go on the run, Nilah has only one person she can turn to: a woman by the name of Boots. When the two women find one another, they are brought on board a smugger’s ship; one that Boots has a past with and one that will lead them to the justice they seek. I really enjoyed this one from start to finish and it will go down as one of my top reads this year. The author’s ability to spin science fiction and fantasy together so seamlessly is quite astounding. What is really going to keep you engaged are the characters. While Nilah and Boots do share some screen-time together, we generally follow them separately on their own missions, each with their individual obstacles and goals but all of which intertwine. Their consistent sarcastic nature with one another and the secondary characters is, for me, reminiscent of Michael R. Fletcher’s ‘Manifest Delusions’ series. You are constantly in the minds of these characters and are able to see just where their loyalties lie, and what their motives truly are. Having said that, I really stayed for all of the action. Space battles, magical duels, and whiplash filled racing keeps this novel going at rick-roaring speed. You really feel like you are in the midst of all of the action and are left bloody and sweating by the time the battles are over. There is also the overarching mysteriousness of the villain, simply named Mother. Who is she, why is she killing everyone, and whose Mother is she? (That last one is a joke and a bit ridiculous, even for me). If you enjoy fast-paced novels chock-full of warring space cruisers, magic infused race cars, and tons of killing, this novel is right up your alley. I for one am excited to see where this story goes as we have two (2) more books to look forward to. Keep an eye out for White as they will become a household name here soon, bank on it. Alex White is an individual “he”, not a mashup like “James Corey”. Pingback: Buzz is Building Over A BIG SHIP AT THE EDGE OF THE UNIVERSE! – Writer.